"Kinshasa Symphony" shows how people living in one of the most chaotic cities in the world have managed to forge one of the most complex systems of human cooperation ever invented: a symphony orchestra. It is a film about the Congo, about the people of Kinshasa and about music. One of the youngest, biggest, most chaotic cities in the world. One of the fastest growing megacities, a veritable Moloch. Poet Thierry Mayamba Nlandu describes the city as “beyond chaos”. He should know. He is a genuine “Kinois”, an inhabitant of Kinshasa. The tortuous paths of these “Kinois” through the different worlds of the city converge at the rehearsal venue of the only symphony orchestra not only in Kinshasa or the Congo, but in all sub-Saharan Africa. 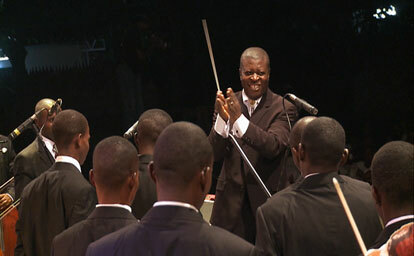 Chantal, Joseph, Albert, Armand and the orchestra have allowed us to accompany them with the camera wherever they go. The time we allow ourselves to get to know one another, the intensity of these encounters and the love of classical music we all share enable us to paint a fascinating picture of the lives of people in the present-day Congo. It is a film about a city in Africa, its citizens – and the music they perform: Handel, Verdi, Beethoven. 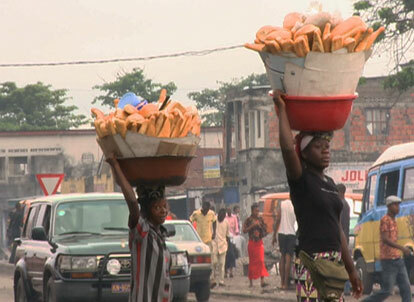 “Kinshasa Symphony” shows Kinshasa in all its diversity, speed, colour, vitality and energy. The sound of this city and its orchestra is conveyed by a sonic design that blends the music with the atmosphere of Kinshasa. For many years this was not only a very difficult undertaking, it was officially prohibited. Dictator Mobutu did all he could to prevent the world from witnessing the decay of his country. This is why the only pictures we have of the Congo, to the extent that they exist at all, come from news reports. “Kinshasa Symphony” paints a very different picture of the Congo. The orchestra’s collective music-making, the rehearsals and the concerts they lead up to show our protagonists in the company of over two hundred other “Kinois”. The results are magnificent and inspiring images of the courage and determination with which Congolese civic society sets out to free itself from a vicious circle of colonial oppression, tyranny, poverty and war that has had them in its grip for decades.